The choice is yours. The debate about a Dive Computer's Algorithm is Over. It is no longer about whether an Algorithm is Right-or-Wrong, Liberal-or-Conservative. It is simply about what is Right-for-You-at-the-Current Moment. You no longer have to choose a Brand-Based on your Decompression Algorithm Preference. Oceanic's given you the choice depending on who you're diving with or the kind of diving that you're doing, with the first dive computer powered by our exclusive. The Oceanic OCi is an Advanced All-In-One Dive Computer featuring Oceanic's exclusive Dual Algorithm, Wireless Air-Integration, Digital Compass, Remote Buddy Pressure Check, and so much more, all in a Strong, Lightweight Titanium Housing. The OCi Computer is powered by Oceanic's Exclusive Dual Algorithm - Your choice between Pelagic DSAT (Spencer/Powell data basis) or Pelagic Z+ (Buhlmann ZHL-16C data basis). This Wireless Air Integrated Technology Systems Forged Titanium Body with 660' (200 meter) Depth Rating with Advanced Digital Compass that provides North, Reference, Auto Home, and Declination Adjustment (see NOAA's NGDC geomagnetic chart) and can Switch between 3-Independent Transmitters, with up to 3-NITROX Mixes to 100% O2 will meet all your today Diving Needs and those in the Future! No need to Stow it in your Gear Bag while Traveling or Everyday for that matter. The Computers Advanced Watch Functions including Alternate Time Zone, Stopwatch, Lap Timer, Daily Alarm, and Countdown Timer. You may never want to take it off! When Diving the Computer has Deep Stop with Countdown Timer, Gauge Mode with Run-Timer, Watch, Norm (AIR/NITROX) Gauge, and Free Dive Modes of Operation. The Computer is Water or Push Button Activated. Want to Customize your Own-Safety-Factors? The OCi Computer provides Personal Conservative Factor Adjustments (PCFA). Each Level of the PCFA provides No Decompression Limits for the next Dive +3,000' (920 meter) Altitude Adjustment. The Computers Altitude Algorithm is based on the NOAA Model and provide Altitude Adjustability from 2,000' to 14,000' (610 to 4,200 meters). The Computer has an Operational (Gauge/Free Dive Modes) Depth of 660' (200 meters) with a (NORM Mode) Depth of 330' (100 meters). 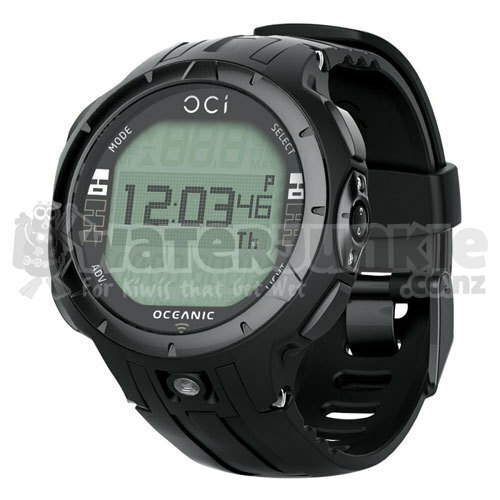 When in Low Light Conditions the OCi is equipped with Smart-Glo Backlight with an Adjustable Duration Function. The Computer is powered by a CR2450 Lithium Battery that can provide up to 300-Dive Hours. The Computer allows Battery Hot Swap to Retain-Dive-Data along with a Graphic Low Battery Indicator. The Air Time Remaining feature Calculates Current Depth, Tank Pressure, Breathing Rate, Ascent Time, and Decompression Status to tell exactly how much time you can remain underwater. The OCi Dive Computer Continually Displays Air Time Remaining via a Numerical Bar Graph in addition to Cylinder Pressure. You may also Display Air Time Remaining in Oversized Digits at any time with the Press of a Button. Dive Time Remaining, like Air Time Remaining provides a 'Real' Number in minutes. This Calculation combines Air Time Remaining, Nitrogen and Oxygen Absorption, Displaying whichever allows less time. The OCi features Push-Button or Automatic Activation, Triggered by Water Contact. A benefit of Push-Button Activation is easily verifying Operation and Cylinder Pressure, but in case you forget, or simply choose not to activate your computer, it can be as simple as jumping in the water. Other features of the OCi Computer are Alarm Acknowledgment, Ascent Rate Range, Ascent Rate Maximum, Decompression Capacity of 10' to 60' (3 to 18 meters), Deep Stop Function, Automatic Safety Stop Prompt, Audible Alarms, Calendar/Clock, 24 Hour Time to Fly Countdown, Calculated De-Saturation Fly Countdown, Dive Mode Displays, High O2 and PO2 Alarm/Warnings, 24 Dive On-Board Log Capacity, Temperature Display, Nitrogen and Oxygen Tissue Loading and Loading Bar Graphs, No Decompression Time Remaining, O2 Time Remaining, Variable Ascent Rate Bar Graph, Set Max Depth Alarm, FO2 Value (%) for 3 Gases, Max PO2 Alarm, Free Dive Settings, Unit of Measurement Setting and Much More. Computer is covered by a 24 month limited warranty. Meet All-your-Today Diving Needs and Those-in-the-Future!